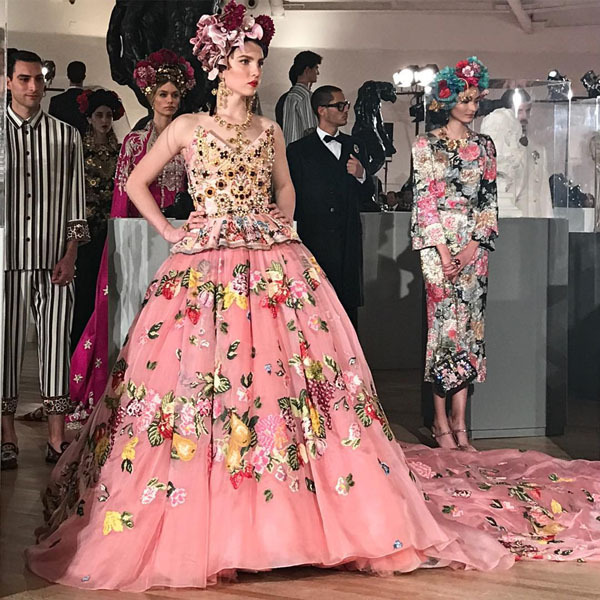 Maya Henry, model, actress, and reality star of “Hangin’ with Los Henrys,” opened the highly anticipated Dolce & Gabbana Alta Moda Alta Sartoria runway fashion show at the Soumaya Museum in Mexico City. Maya wore a stunning floral embroidered and jewel encrusted Dolce & Gabanna couture gown with a garland of flowers in her hair. The runway show took place inside the Soumaya Museum, located in the upmarket district of Polanco. Models walked a runway flanked with works of art and precious sculptures. The entire Henry family (stars of “Hangin with Los Henrys) also came out to support Maya’s debut. Model/influencers Michelle Salas, Diego Boneta, and Junapa Zurita also walked in the show. The show was attended by Italian actress and Dolce & Gabbana muse Sophia Loren. Dolce & Gabbana unveiled a similar showing of their Alta Moda women’s couture collection earlier this month in New York City, where Maya attended and sat front row. The New York City show was opened by supermodel Karlie Kloss.